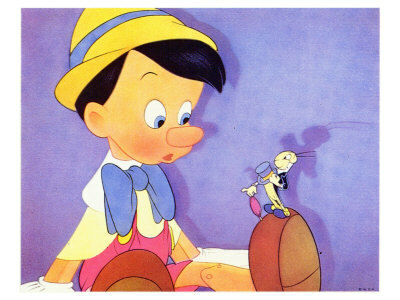 Jiminy Cricket serves as the conscience for a wooden puppet brought to life by the Blue Fairy in Walt Disney's Pinocchio in 1940. Since his debut Jiminy has become an iconic Disney character. He's hosted many Disney cartoons and tv specials, he appears in the Kingdom Hearts video game series, and can be found at Disney Parks world wide. I love that he's also a character in the ABC show Once Upon a Time! Raphael Sbarge plays Jiminy Cricket and Archie Hopper, the human version who lives in Storybrooke, Maine. They created a whole backstory for Jiminy. He was the son of two swindlers who wanted to escape the life he had. He wished on a star and the Blue Fairy asked him what he'd rather be. He chose to become cricket, who who he always thought of as being free. "Well, Pinoke, maybe you and I… had better have a little heart-to-heart talk." "All right. Sit down, son. Now you see the world is full of temptations." "They’re the wrong things that seem right at the time but… even though the right things may seem wrong sometimes, sometimes the wrong things chuckles may be right at the wrong time or… visa versa. Ahem. Understand?" There are tons of options for drinkware. This is an 11 oz. Ringer Mug with a lime green handle and lip. There are ten colors to choose from in this style. Other options: Classic White Mug, Two-Tone Mug, Morphing Mug, Stein, Travel Mug, and Frosted Glass Mug. This is the graphic used in my intro. There are three different sizes, and twelve different denominations. You can also choose the orientation. This image also looks really nice on a mouse pad. This Rickshaw iPad sleeve is water resistant and has a padded liner. There are fifteen lining colors and twenty binding colors to choose from. It's shown here with a white liner and saffron binding. There are also sleeves for MacBook and MacBook Air. ... and always let your conscience be your guide. Funko gives this classic character a new look. 3 3/4" tall. For ages 4+. Jiminy is the seventh character in Disney's POP! Series 1. How I learned to spell Encyclopedia. I still have to sing it in my head to get it right. 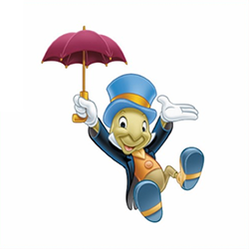 Everyone's favorite conscience, jiminy cricket comes complete with a match box stand that really opens. 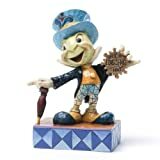 This limited edition enameled metal Jiminy Cricket figurine is set with 199 Swarovski crystals. You can see Jiminy standing on the branch above Pinocchio's head. 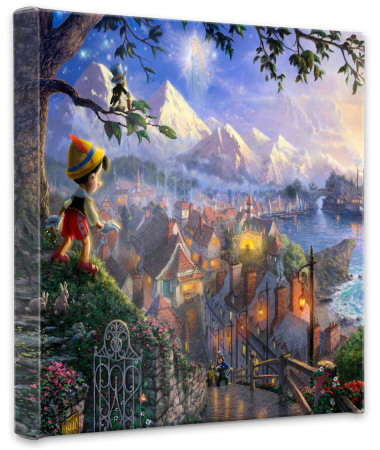 "For my painting Pinocchio Wishes Upon A Star we see Pinocchio upon a hillside overlooking the setting of his adventures. We see Honest John and Geppetto's workshop where Pinocchio was formed. On the right we see Pleasure Island and Monstro the whale preparing to engulf Geppetto's sailing vessel. Butterflies and sparkles lend magical accents as the Blue Fairy and Jiminy Cricket look on." Give a Little Whistle Here! Nice article. It is amazing how many Disney items are on Zazzle. I didn't realize Jimminy Cricket was still around. I remember watching a Jiminy Cricket science cartoon in school during the 1950's.